University of Iowa officials say it was a mistake for the school’s mascot to appear at a fundraiser earlier this month featuring several Republican presidential candidates. UI spokesperson Jeneane Beck told KCRG-TV that the school’s spirit squad agreed to send Herky to U.S. Senator Joni Ernst’s Roast and Ride not realizing it was a partisan event. “It was billed as an event, a motorcycle ride for veterans and heroes, that’s the way it was written. There was no ill intent on either side, it was just a mistake,” Beck said. The event started with a motorcycle ride from a Harley-Davidson dealership in Des Moines to a barbecue in Boone. 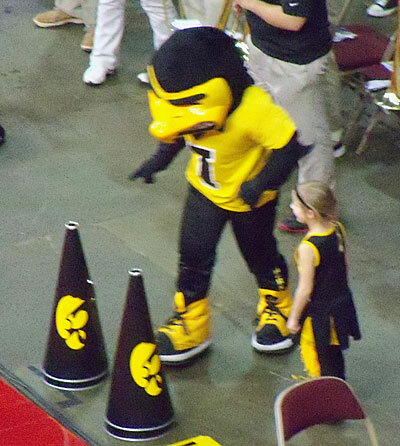 Herky and Cy, the mascot for Iowa State University, were both paid to appear at the event in Boone. The mascots posed for photos with attendees. ISU spokeswoman Annette Hacker said the athletic department will be reviewing its policy on which events Cy can attend after criticism following the Boone fundraiser.